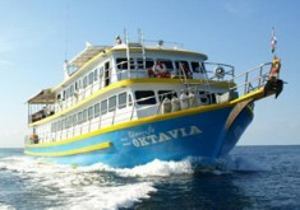 The Similan islands openning season and Surin islands national park is only open from 15th of October to 15th of May. 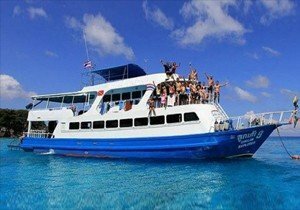 Depending on the year, the department of national parks decides of the Similan islands season dates. 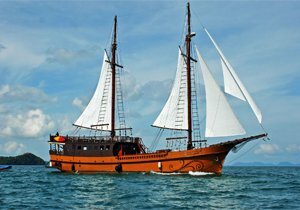 When the Similans islands closed we do have some liveaboards around Koh Phi Phi and the South-Andaman (between Jun to September). 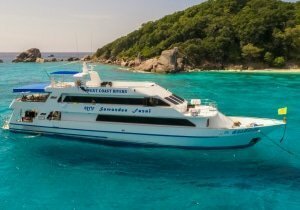 Diving the Similan islands on liveaboards is by far the best way to dive the Simlan islands. 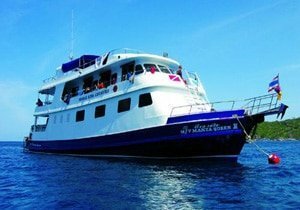 Our Similan islands Liveaboards Fleet will take you to all the best dive sites of the Similan islands national Park and Surin national park and of course you will be diving Richelieu Rock! 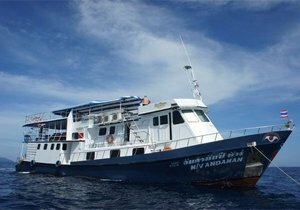 The Similan islands being quite far from the coast (70km), Similan Islands scuba daytrips are time consuming and rather expensive if you compare with diving similan islands liveaboard price per dive. 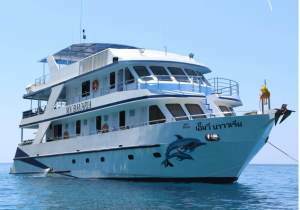 You will save money being on our Similan islands liveaboards you will get fed, sleep and dive for the duration of your choice, from 2 days 1 nights to 5 days 5 nights. So you you don t need to spend money on an hotel. 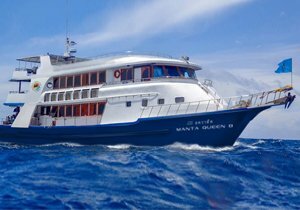 We have a scuba diving liveaboard for everyone, small budget, standard or luxury liveaboard similan islands, we will find you the right one for you. Similan and Richelieu Rock liveaboards are a must do in the area, dive make friend, be happy. 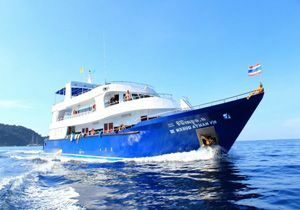 Diving in Thailand is amazing, check out this article from PADI, about why diving on liveaboards should be part of your holidays. What duration and Schedule to choose? Depending on your holiday time in Thailand, you want to maximize your dives and you rest time, right. 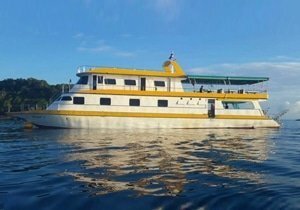 Our scuba diving liveaboards longer than 2 days starts always in the evening, which mean you can enjoy your day before departure and cruising to Similan will be done at night. That allow us to pick up customers arriving on the day at the airport, from Phuket or give time to customer to arrive from their previous destination. Starting from 2 days 1 night, 3 days 3 nights, 4 days 4 nights and up to 5 days, our Similan islands liveaboards have all the necessary comfort on-board, you will have time to relax on the sundeck to get a tan, read a book in the saloon, sleep, relax, have a nice conversation with your dive instructor or buddy. Diving on Similan islands liveaboard is such a pleasure, every morning you wake up , get fed with a delicious breakfast, go diving, have a nap, eat, go diving , sleep, eat and so on!! We highly recommend Open Water Divers to continue their education onboard and become Advanced Open Water or equivalent certification to be able to fully enjoy the dive sites depth, area and diversity. Dive courses are available onboard for whoever want to continue their dive education. We have a wide range of scuba diving course available. Not compulsory but highly recommended that you subscribe to a dive insurance, you can purchase a daily assurance at our office, or get yearly one with DAN Asia or DAN, the Similan islands being 70km from the coast and being a popular dive spot, their is a re-compression chamber based in Phuket (SSS), accident are rare, but it’s always better to be prepared and covered. On the day of departure we pick you up from your hotel and drop you back in Khao Lak on the day of return. 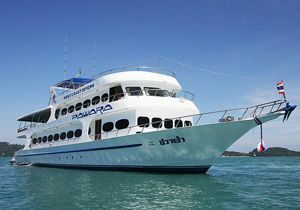 For most of the liveaboard the pick-up are free and included, these pick up are at a given time, and a minivan picking up divers goign on the trip. So it can take a while if the previous customer is late or traffic jam in Phuket. If you stay in Khao Lak and check out in the morning, feel free to ask your hotel to keep your luggage until pick up time or come to our dive center by yourself during the day to drop your luggage. We can keep some of your luggage for the duration of the liveaboard if you don’t need it, the less you take the more room in your liveaboard cabin. First ask yourself 2 questions: How much time you have and budget? 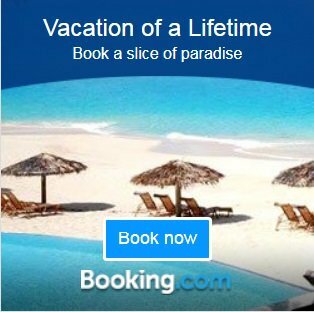 With this we will find you the best deal meeting your criteria, you can send us an email or have a first look yourself to see what fit your holidays dates and budget. 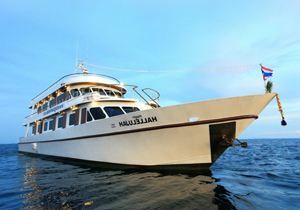 You can select below the similan islands liveaboard duration you are looking for, on the liveaboard search, then choose your Similan liveaboard and check if the schedule fit your holidays dates, there is different type of cabins onboard, all prices are up to date and prices depends on cabins type. Contact us to check for availability, we will get back to you within 24h. Sylvain & Yaya are your personal booking contact managers at Khao Lak Explorer, they will answer all your question by email, phone or other way to contact us available. 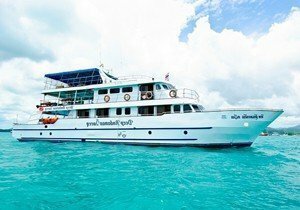 With more than 10 years diving around the world and working in the dive industry in Khao Lak, they will provide you with all the needed information for your liveaboard, daytrip or other tours. 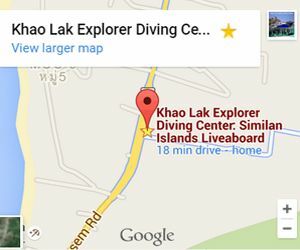 We can provide you with a package of services for your dive trips, here in Khao Lak, our office right in the center will provide you with further information, check in, dive gear and so on. See you soon. The Similan islands national park is groups the following islands, Similan islands (9 islands), Koh Bon (Manta Ray dive site), Koh Tachai (one of our favorite island). Richelieu Rock (the best dive site of Thailand) which is part of the Surin Islands national park north of the Similan islands. What divers who doesn’t know the area tend to fail to understand is that Koh Bon for example is part of the Similan islands but a separate island. The Similan islands have a lot dives sites, fringing reef and huge granite bolder are the underwater scenery. Easy dives for all divers, sometimes a bit more difficult with current, but nothing insurmountable. 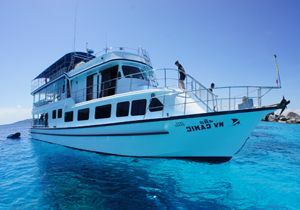 We usually start at Similan islands 4 with an easy check dive, there if you choose a 4 days or longer live-aboard. After the first day at the Similan islands, you will move up to Koh Bon lying den of the giant manta rays. The main attraction at Koh Bon is the Manta Ray sighting, this limestone island and it s manta cleaning station, attract the huge pelagic between the similan manta ray season from December to April, sometimes they come earlier, sometimes later, depending if their boss give them holidays, if you know what I mean. 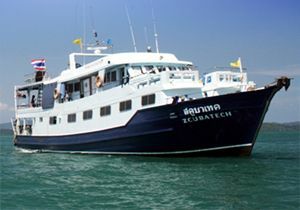 The next day you will cruise to Koh Tachai also called the “virgin island”, the main dive sites there is a huge granite boulder plateau, covered of soft coral, sea fans and marine life. The strong current bring food form the depth, trevallies, snappers feed on it, mantas and whale shark also comes often their for feeding and swimming in the current. It s a fish soups, a real aquarium. 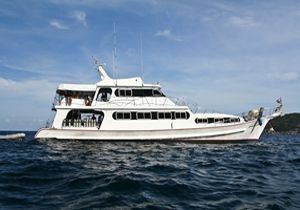 It s one of the favorite spot to see Whale shark or Manta between January to April and one of our personal favorite. 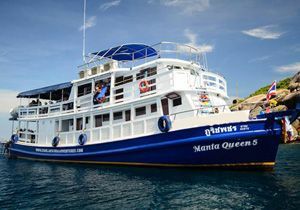 Next day your Similan cruise will goes up to the world famous Richelieu Rock, one of the best dive sites in Thailand. Discovered by Jacques Cousteau, an huge underwater limestone pinnacle a few km away from Surin islands archipelagos is covered of purple soft coral and anemones. It s a paradise for diving and underwater photographer, videographers or simply scuba divers who enjoy macro life, schools for fish everywhere and one of the best dive site to spot Whale Sharks during the Similan whale shark season. 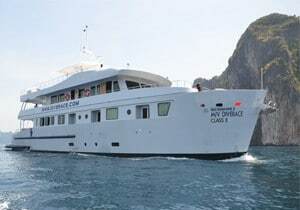 “Our Similan islands liveaboard was perfect from the day we got picked up to the return. The dive gear was brand new, the crew very friendly and the food onboard was delicious. It was our first liveaboard and after 4 days we wanted more. Our dive guide was patience and took good care of us. We were lucky to see 2 Manta rays during the trips. 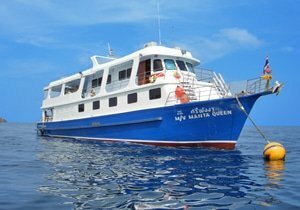 “Great Similan islands diving trip, from first email to the end of the trip Khao Lak Explorer has been very helpful, thanks to Sylvain and his team. We really appreciated diving with nice equipment, the booties was a great addition, diving 10 times in 3 days would not have been enjoyable with normal fins. The Thai liveaboard boat crew was amazing, super friendly and very attentive to details, sliding your fins on when you are getting ready is just perfect. Big Thanks to the cook, we did enjoy every meals from breakfast, snack and diner, you never get hungry onboard. I was planning on loosing weight but it will be for another time! 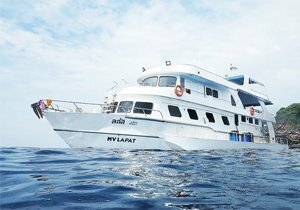 Thanks for the great advices, care and dedication of Khao Lak Explorer liveaboard team for this great scuba diving experience. We had a great time onboard! The Similan islands blessed us with Manta ray sighting on the second day. highly recommened.